After completing a PhD in biochemistry, Dennis Breitsprecher was sure that he wanted to pursue an academic career. However, he grew bored of constantly writing papers and grant applications as a postdoc, and is now Head of Biochemistry R&D at NanoTemper in Munich. 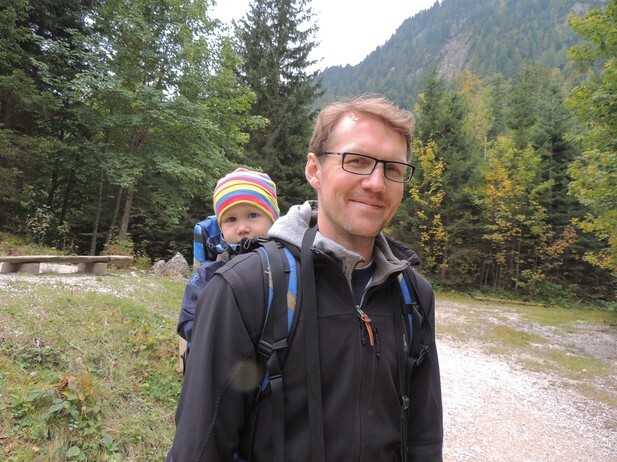 Dennis Breitsprecher hiking in the Alps with his youngest son. What first inspired you to study biochemistry? In school – I think it was 10th grade or so – we had a very good biology teacher who taught us how photosynthesis works on more or less a molecular level. He showed us X-ray crystal structures of the photosystem, and I was amazed because we could see all these tiny machines that are the origin of all life on earth. What was the highlight of your career in academic research? CV-wise it was publishing a paper in Science when I was a postdoc: the paper attracted a lot of attention and led to me giving talks to large audiences at conferences with thousands of participants. But to me, it didn’t really feel like the biggest achievement – that was the first paper I published during my PhD. Why did you want to move into industry? Multiple reasons. My PhD went very well and at first I had no doubt that the academic path was the right choice. I got funding to conduct a postdoc in the US, I found a very good lab there, I liked the PI, and everything sounded great. However, I was expecting my postdoc to offer something "more" than my PhD and, basically, I found that it was exactly the same. What, in particular, did you find frustrating during your postdoc? The major thing was that I got increasingly bored of writing papers. All the work was writing grant proposals, writing publications, which is very repetitive. I think I have 23 publications now and I don’t remember many of them in detail. They’re written, they’re submitted, they’re published, you say, “yay, my paper was published”, and then you move on to the next paper. Sadly, as a scientist, that is how your success is measured. What other academic problems did you encounter? I was also confronted with the postdoc bottleneck that everybody talks about. You have these labs in which half of the researchers are postdocs, and most of them have already spent years in the lab. Yet many postdocs are told by the PI, “you’re going to be a great professor, you just have to publish this one more paper, and maybe do another postdoc”. You are not introduced to alternative career paths. It was tiring. How did you hear about the job at NanoTemper? I found the job advert on the internet through pure luck as I wasn't actively looking for a job in industry. I had applied for a couple of assistant professorships, mainly in Europe, but I always had the feeling that I had to beg to get the position instead of the institutes wanting to hire me. Once, I was told, “the reason why you were invited was that one Science paper”. Having over 20 publications in total, that was really weird and told me a lot about the academic system. The night that I saw the advert I sent a letter and my CV to NanoTemper. It was a very heartfelt letter – I wrote that I was a good match because I struggle all the time with these kind of experiments and I know NanoTemper’s technology, it looks very promising, and so on. So we had a Skype interview maybe a week later and after another week I got a job offer. What a difference to academia! The company was small back then, but that was also really interesting to me: to be part of building a company, rather than being an exchangeable part. What are your main responsibilities as Head of Biochemistry R&D? They are many. We build instruments for bioanalytics, so the main responsibility is to test and help develop new technologies and prototypes. This involves maintaining and establishing lots of collaborations – with big pharma companies for instance. I’m also basically the current product manager, so I take care of the existing technologies and come up with new applications. We also write papers if we have something new, so I can still publish. Despite what I said earlier, I don't mind writing articles – it only becomes boring when it is the only thing you do. What’s the R&D department like? There are about eight of us now, and we also have undergraduate students on placements and a PhD student. It’s pretty comparable to a university setting, but the research is more goal-oriented, and more fast-paced. Yesterday was busy. I’m in the process of teaching an undergraduate and an intern, who are working on the development of a couple of instruments. I also had meetings with our software development department: we are in constant communication about software because R&D are basically the first people to use new software and hardware. I also did some experiments myself, which is rare. Then, in the evening, I gave a webinar to introduce some new technology to scientists. The interdisciplinary work. Most people who work at NanoTemper – software developers, physicists and engineers – all have entirely different backgrounds and views on a problem. You learn so much from them! And of course, it’s really exciting to see an instrument emerge from the very first prototype, which takes about one and a half years. Then you sell it to customers and they come back to you and say, “wow, it’s an amazing instrument”. That’s cool. What skills did you develop during your PhD and postdoc that you use regularly now? That’s a difficult question. It was good for me that I wrote most of my publications more or less on my own. When doing my postdoc I also learnt how to give much better talks. In Germany, young scientists are not taught how to write a scientific paper or to give a scientific presentation, but these skills are very important in any science related job! I also refined my problem solving skills, and I think this is one of the main reasons I was hired. All the projects in my PhD and postdoc established entirely new approaches through a process of trial and error, drawing the right conclusions and then proceeding from there. This flexibility is really beneficial in a small company. How does industrial research differ from academic research? The biggest difference, and I’m always baffled by this when I look back at what I did as a postdoc, is that you’re more or less expected to do everything on your own in academic research. That’s utterly ineffective. In industry, if you know that something could be done better, then you look for someone who can do it better than you can, and invest a little bit of money in them. I’ve heard that companies expect employees to work very hard during the day, but also that the work does not take over your life. Yeah. So days can be very stressful, and sometimes a deadline means that you have to work from home at night, but that’s quite rare. In industry you have your vacations, and I don’t work at the weekends. But when I was doing my PhD and postdoc the professors were always saying things like, “I never had a day off in my first years as a PI”, and they were proud of it! I couldn’t identify with that because there’s much more to life than just working. So what do you do outside of work? I have two great kids, who are four and seven years old, so me and my wife spend most of our time with them. Munich is a very nice city: you can ski in winter, and go cycling along the river in the summer. There are also mountains for hiking, great playgrounds everywhere, and beer gardens. I really missed spending time outside when I was in the US. Finally, what advice would you give to early-career researchers who would like to move into R&D? Start networking as soon as possible, and even try to do a PhD in a company right away. You have a better chance of getting hired in big pharma companies, for instance, if you have already done an internship there. And what I would also suggest is not to do a postdoc in academia just because it seems like the easiest path. What we have found is that you do not acquire any additional skills during a postdoc that help you land a job in an industrial R&D setting.